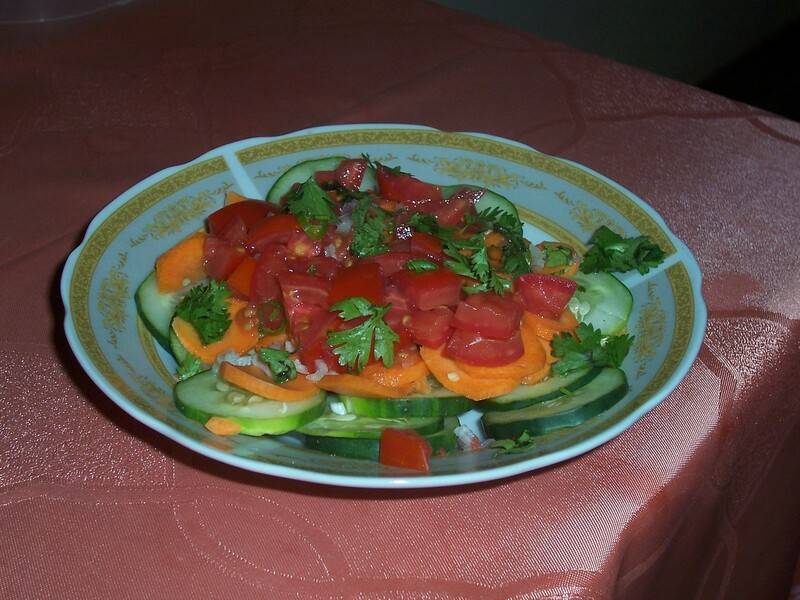 A Tala Salad | Hujambo! I ate a bunch of crappy food today so I wasn’t looking forward to deciding what to eat for dinner. I got to thinking and figured I’d really like to have a nice salad. Well there’s no lettuce anywhere around Tala so I had to improvise a bit. I ended up just mixing cucumber, carrots, tomatoes, onions (kidogo tu!… “just a little”), cilantro, and some hot pepper (raw). The pepper was a little on the hot side, oops, but the cucumber was refreshing, and I’m sure the carrots are helping somehow too. Maybe vision? Other than that, I cooked a lot of fried rice a few weeks ago, and this week I was experimenting with beef stew since I had a really sweet one in Nairobi at Tash’s house over Easter weekend. I learned that beef gets very tender in a pressure cooker! pretty! minus the cilantro! yuck! !